Kelly Green….my favorite color on my baby boy…. When my children were but little tykes I’d dress them up in little overalls…you know the ones bearing the OshKosh® label. My son had three or four pairs, in a spectrum of primary colors, and my daughter had a pair of dark pink ones (to include her brother’s hand-me-downs). 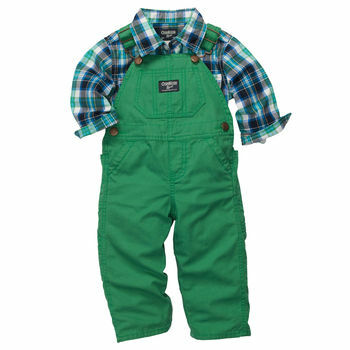 My son used to wear a pair of Kelly green OshKosh® overalls. He was 18-months old when we moved to Germany and you could spot him a mile away with his curly red hair and his Kelly green OshKosh® overalls. Funny thing about those overalls though….we used to say they were jinxed or had some voodoo spell on them. You see nearly every time my little one wore those overalls he’d get hurt. Big boo-boos and little ones…lots of crying and lots of kisses went with those overalls! One time we were enjoying lunch with friends in a quaint German restaurant/bar; my two-year old son, in typical toddler boy fashion was the epitome of the energizer bunny that day. He tripped on something (we’ll never know what) while running and literally flew head first into the side of a radiator. Naturally he was crying in pain in an instant but worse yet in the blink of an eye we saw the giant goose-egg growing from the middle of his forehead…followed by vomiting. We’d gone from playing to one of a parent’s worst nightmare in seconds. With lightening speed were flew out of that restaurant and somehow made it through noon-time traffic in a sprawling city to the American military hospital across town. Yep…my little one had a concussion. We just had to monitor him closely for the next 24 hours or so and then he’d be fine. After the whole ordeal, I briefly thought of burning those green overalls to break the spell of boo-boos and bandages…but I couldn’t bring myself to do it…I just loved him in those overalls. So, I kept them. Turns out that two years later I’d be on the cusp of welcoming another child into the world (my daughter); when I surveyed the baby clothes that had been folded and stored away I found those green overalls. A lot of my son’s baby clothes were suitable for a little girl…primary colors and no tell-tale boy appliques or images. Hmm…wonder what will happen when the new baby wears these, I thought. As luck would have it, my daughter wore those same overalls for months without so much as a scratch. My friends (the same folks who’d witnessed the many ordeals with my son in those green overalls) thought I was nuts when they saw my daughter wearing them for the first time. “She seems to have broken the spell” I happily told them. So here’s the thing. I haven’t seen overalls of any label–except for the occasional infant or toddler–for years and years since my kids were little. That’s going on twenty-five years. However, since moving to this here “middle earth” land I see overalls nearly everyday! I kid not. And no….I don’t see overalls on little kids…I see them on GROWN adults…mostly men mind you, but women too. Yesterday I was in the gym working out and yep…you guessed it……here comes a Duck Dynasty look-a-like (pick any of those show characters) wearing Oshkosh jean overalls and an old plaid shirt…his scruffy, completely gray beard long enough to graze the front pocket of his overalls. He’s working out on the stair master wearing overalls that were a tad short, black socks, and Nike Air sneakers…what a combo! And today, when in the grocery store line, I turn to see that the woman behind me is wearing overalls. She looked to be in her forties….and if frumpy was the look she was going for she most definitely succeeded. I’ll confess to not being the most fashion forward kind of gal (REI clothing and yoga attire are my mainstays) but I’d hope that if I showed up in overalls (for other than a Halloween party, that is) my “Evil Twin” or my beloved sister–or anyone for goodness sake— would play fashion cop and have me out of those in a New York minute.